This candle is specially made to create an atmosphere of Peace and Harmony. The glass jar indigo candle is decorated with Chakra symbol for Anja (Third Eye / Brow Chakra). 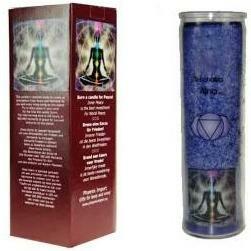 The candle comes with a guide to the Chakras in English, German and Dutch. The candle is produced out of 100 % stearin or palm wax and includes 3% pure essential oils (Lavender, Fir, Chamomile). Stearin is a renewable resource that always can be replanted. It makes the candle burn very clean and smokeless. The wick used is pure cotton. As a result you will have a very steady bright flame and no waste-product as the candle burns itself out. The candle is paraffin free. It has no metal-lead or zinc-contents. Neither has it any animal derived ingredients. Please note: This glass jar candle is very heavy and that will be reflected in the postage cost for this item.